This year, with my move to sixth grade, I've been having so much fun with classroom committees! They are a great way to engage kids in managing important classroom routines and processes. With committees, students take charge of various parts of the classroom. A committee is a group of students focused on doing a job in the classroom. At the start of the year, my classroom had five committees: Library, Art, Science, Birthday, and Pencil. The library committee worked to organize our classroom library and set up book displays, the art committee made classroom art displays and contests, the science committee organized and displayed science materials, the birthday committee made a class birthday display, and the pencil committee organized classroom pencils. In the second quarter, we changed committees, and I made a few changes. 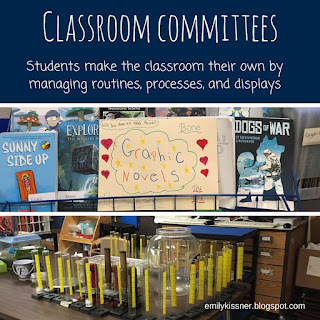 Students requested an organizing committee instead of a pencil committee, and the birthday committee had completed their task of creating a classroom birthday display. We added a wildlife committee instead, with the job of taking care of our fish tanks and filling the feeders. It's neat to see how committees evolve and change. The library committee started the year with one process for signing out books, but refined the process over a course of weeks. The art committee ran an art contest in the first month of school, but has now changed their focus to work with maintaining and organizing art supplies. We have regular committee meetings once each six-day cycle, on a day when I have my homeroom for an extended period of time due to the schedule. Students request committee meeting time! I also give committees new tasks when needed--for instance, today members of the science committee organized our graduated cylinders. What happens when committees don't do their jobs? This is what happens in real life, isn't it? Committees have trouble functioning, some groups don't follow through, and kids have disagreements. We work through it all! Sometimes I make quick decisions and act as arbiter, but more often I just listen and ask questions. Often in the answering of questions kids start to see solutions on their own. 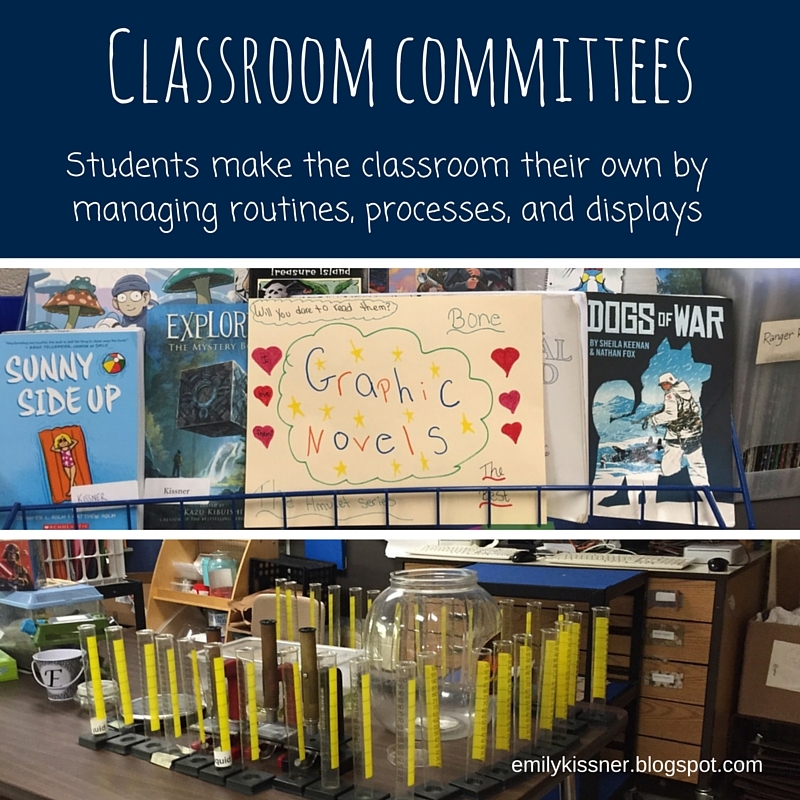 Committees are a great way to engage students in the daily running of the classroom. How do they work in your classroom? 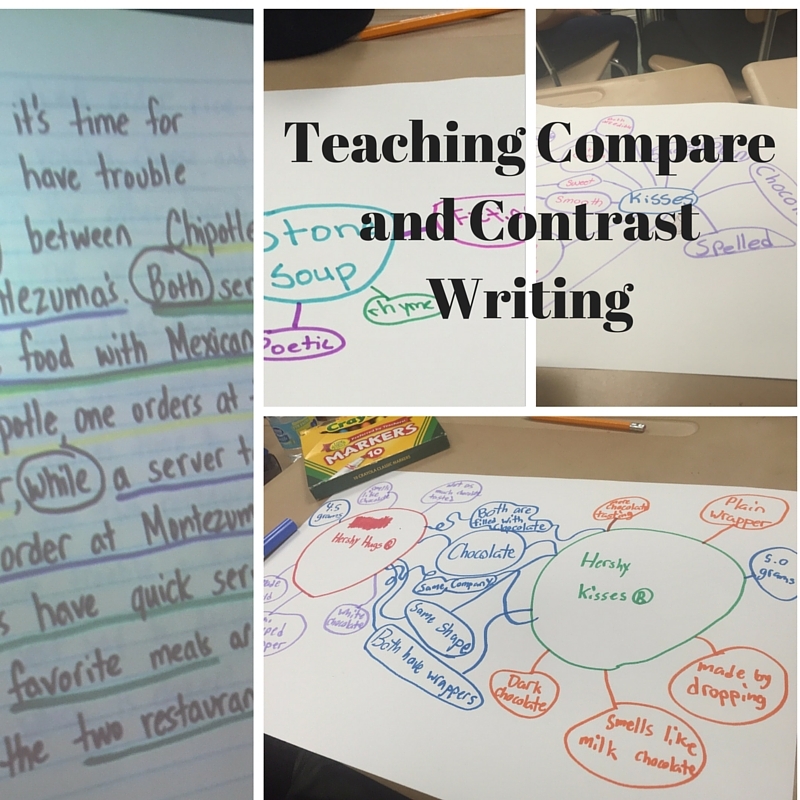 Teaching students how to effectively write to compare and contrast is so important for teachers of all grade levels. Comparing is important for test-taking, but it's important for life, too. Readers of wildlife blogs want to know how cottonmouths are different from copperheads, foodies want to know the difference between cassia cinnamon and ceylon cinnamon, and teachers want to know how different basal series stack up against each other. Kids can get better at writing to compare and contrast very quickly, making it a great writing project for November and December. Here are some suggestions for getting started. Even older kids need concrete experiences! By starting with real objects, kids of all ability levels can learn how to systematically compare. Because last week was Halloween week, we used Hershey Hugs and Hershey Kisses, but you could compare anything that kids find interesting. As kids compare, focus on using language such as similarities and differences to move kids away from terms like sames and differents. 2. When you move to text, discuss: What to compare? Begin this conversation by talking about how students compared the real objects based on their physical characteristics. What could we compare in text? Be aware that what kids say (and don't say) in this discussion will reveal the gaping holes in your reading instruction. And that's okay, because you want to know about those gaps, right? Hopefully, students respond with these kinds of ideas: form (poem, narrative, article, etc), author's purpose, topic, central idea/theme, point of view, tone, word choice, and so forth. Students probably won't know the exact words for all of these, but will remember talking about them at some point in time. The big goal here is to make the shift from the physical world to the abstract world of talking about texts. If you don't hear at least a few of these abstract concepts, you may want to hold off on comparing texts and deal with this issue. I've used them all: Venn diagrams, double bubble maps, charts. The actual organizer is not as important as the thinking that kids put into it and the modeling that you show. 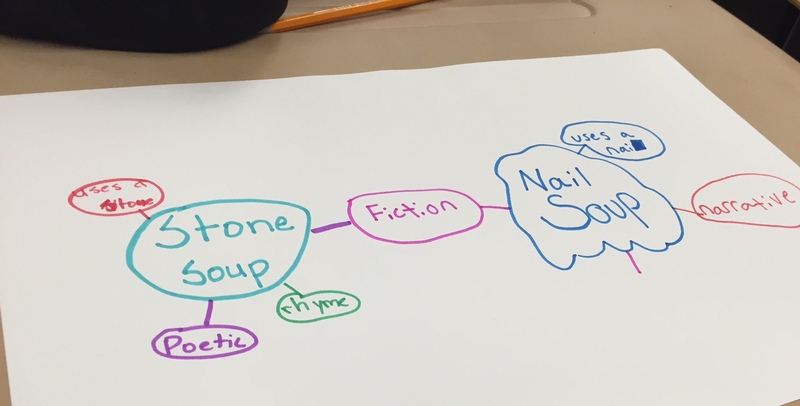 Right now, we are using Thinking Maps again at my school (yay! ), so I am working with those. 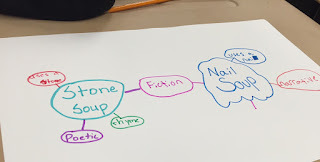 You will notice that my students have used lots of color in making graphic organizer. My students are very visual thinkers this year and LOVE using different kinds of markers as they work. Kids will look at the topic sentences that you model and alter them for their own writing. Variations of the topic sentence that I used in my Chipotle/Montezuma's paragraph has turned up again and again in student writing. Something about this sentence (even though I only showed it on one day of instruction) was compelling and memorable for students. This shows that they are still shaky on writing topic sentences for compare and contrast paragraphs. I'm not surprised that kids are struggling with topic sentences for compare and contrast paragraphs. Many adults struggle with this, too. Are we just writing for the sake of comparing, or is there a point to this comparison? If the writer doesn't know, the reader won't, either! In my Montezuma's/Chipotle paragraph, I created the idea of "choosing" between the two as a reason for the comparison. This can be effective and easy for kids to understand. Without access to strong transitions, students will revert to a "also/but" pattern. Having a list of transitions available to students challenges them to try phrases like "however" and "on the other hand". Creating this list is a good activity to try with students.